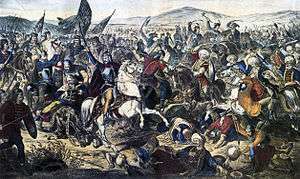 This article is about the Battle of Kosovo of 1389. For other battles, see Battle of Kosovo (disambiguation). For the 1989 film depicting the battle, see Battle of Kosovo (film). The Battle of Kosovo (Serbian: Косовска битка/Kosovska bitka, Turkish: Kosova Meydan Muharebesi) took place on 15 June 1389[A] between the army led by the Serbian Prince Lazar Hrebeljanović, and the invading army of the Ottoman Empire under the command of Sultan Murad Hüdavendigâr. The army under Prince Lazar consisted of his own troops, a contingent led by Serbian nobleman Vuk Branković, and a contingent sent from Bosnia by King Tvrtko I, commanded by Vlatko Vuković. Prince Lazar was the ruler of Moravian Serbia, and the most powerful among the Serbian regional lords of the time, while Vuk Branković ruled District of Branković located in a part of Kosovo and other areas, recognizing Lazar as his overlord. The battle was fought on the Kosovo field, in the territory ruled by Branković, in what is today Kosovo. [lower-alpha 1] Its site is about 5 kilometers northwest of the modern city of Prishtina. Reliable historical accounts of the battle are scarce. The bulk of both armies were wiped out in the battle; both Lazar and Murad lost their lives in it. Although Ottomans managed to annihilate the Serbian army, they also suffered high casualties which delayed their progress. The Serbs were left with too few men to effectively defend their lands, while the Turks had many more troops in the east. Consequently, one after the other, the Serbian principalities that were not already Ottoman vassals became so in the following years. 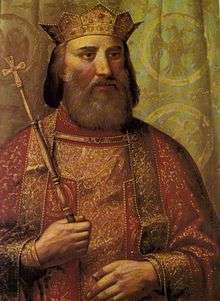 Emperor Stefan Uroš IV Dušan "the Mighty" (r. 1331–55) was succeeded by his son Stefan Uroš V "the Weak" (r. 1355–71) whose reign was characterized by decline of central power and rise of numerous virtually independent principalities; this period is known as the fall of the Serbian Empire. Uroš V was unable to sustain the great empire created by his father nor to repulse the foreign threats and to limit the independence of the nobility; Uroš V died childless on 4 December 1371, after much of the Serbian nobility had been destroyed by the Ottomans in the Battle of Maritsa earlier that year. Prince Lazar, ruler of the northern part of the former empire (Moravian Serbia), aware of the Ottoman threat, began diplomatic and military preparations for a campaign against the Ottomans. After the defeat of the Ottomans at Pločnik (1386) and Bileća (1388), Murad I, the reigning Ottoman sultan, moved his troops from Philippoupolis to Ihtiman (modern Bulgaria) in the spring of 1388. From there, the party traveled across Velbužd and Kratovo (modern R. Macedonia). 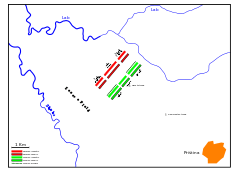 Though longer than the alternative route through Sofia and the Nišava Valley, this route led the Ottoman party to Kosovo, one of the most important crossroads in the Balkans. 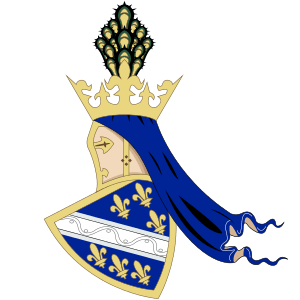 From Kosovo, Murad's party could attack the lands of either Prince Lazar or Vuk Branković. Having stayed in Kratovo for a time, Murad and his troops marched through Kumanovo, Preševo and Gjilan to Pristina, where he arrived on June 14. While there is less information about Lazar's preparations, he gathered his troops near Niš, on the right bank of the South Morava. His party likely remained there until he learned that Murad had moved to Velbužd, whereupon he moved across Prokuplje to Kosovo. This was the best place Lazar could choose as a battlefield, as it gave him control of all the routes that Murad could take. Reliable historical accounts of the battle are scarce; however, a critical comparison with historically contemporaneous battles (such as Ankara or Nikopolis) enables reliable reconstruction. Murad's army numbered from 27,000 to 40,000 fighters. [B] These 40,000 included no more than 2,000 Janissaries, 2,500 of Murad's cavalry guard, 6,000 sipahis, 20,000 azaps and akincis, and 8,000 troops from his vassals. Marko and Dragaš, although Ottoman vassals, did not participate in the battle. The Ottoman army was supported by the forces of the Anatolian Turkoman Beylik of Isfendiyar. The armies met at the Kosovo field. Murad headed the Ottoman army, with his sons Bayezid on his right and Yakub on his left. Around 1,000 archers were in the front line in the wings, backed up by azap and akinci; in the front center were janissaries, behind whom was Murad, surrounded by his cavalry guard; finally, the supply train at the rear was guarded by a small number of troops. One of the Ottoman commanders was Pasha Yiğit Bey. The Serbian army had Prince Lazar at its center, Vuk on the right and Vlatko on the left. At the front of the Serbian army were the heavy cavalry and archer cavalry on the flanks, with the infantry to the rear. While parallel, the dispositions of the armies were not symmetrical, as the Serbian center had a broader front than the Ottoman center. Serbian and Turkish accounts of the battle differ, making it difficult to reconstruct the course of events. It is believed that the battle commenced with Ottoman archers shooting at Serbian cavalry, who then made ready for the attack. 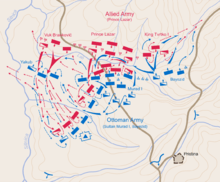 After positioning in a wedge formation, the Serbian cavalry managed to break through the Ottoman left wing, but were not as successful against the center and the right wing. The Serbs had the initial advantage after their first charge, which significantly damaged the Ottoman wing commanded by Yakub Çelebi. When the knights' charge was finished, light Ottoman cavalry and light infantry counter-attacked and the Serbian heavy armour became a disadvantage. In the center, Serbian fighters managed to push back Ottoman forces, except for Bayezid's wing, which barely held off the forces commanded by Vlatko Vuković. Vuković thus inflicted disproportionately heavy losses on the Ottomans. The Ottomans, in a ferocious counter-attack led by Bayezid, pushed the Serbian forces back and then prevailed later in the day, routing the Serbian infantry. Both flanks still held, with Vuković's drifting toward the center to compensate for the heavy losses inflicted on the Serbian infantry. Historic facts say that Vuk Branković had seen that there was no hope for victory, and fled to save as many men as he could. He fled after Lazar was captured, but in songs, it is said that he betrayed Lazar, and left him to death in middle of battle rather than after Lazar was captured and the center suffered heavy losses. Sometime after Branković's retreat from the battle, the remaining Bosnian and Serb forces yielded the field, believing that a victory was no longer possible. 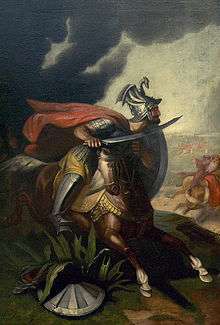 As the battle turned against the Serbs, it is said that one of their knights, who later was identified as Miloš Obilić, pretended to have deserted to the Ottoman forces. When brought before Murad, Obilić pulled out a hidden dagger and killed the Sultan by slashing him, upon which the Sultan's bodyguards immediately killed him. Fortunate, most fortunate are those hands of the twelve loyal lords who, having opened their way with the sword and having penetrated the enemy lines and the circle of chained camels, heroically reached the tent of Murat himself. Fortunate above all is that one who so forcefully killed such a strong vojvoda by stabbing him with a sword in the throat and belly. And blessed are all those who gave their lives and blood through the glorious manner of martyrdom as victims of the dead leader over his ugly corpse. Both armies were annihilated out in the battle; both Lazar and Murad lost their lives, and the remnants of their armies eventually retreated from the battlefield. Murad's son Bayezid strangled his younger brother Yakub Çelebi upon hearing that their father had died, becoming the sole heir to the Ottoman throne. The Serbs were left with too few men to defend their lands effectively, while the Turks had many more troops in the east. Consequently, the Serbian principalities that were not already Ottoman vassals became so in the following years, one by one. Furthermore, in response to Ottoman pressure, some Serbian noblemen wed their daughters, including the daughter of Prince Lazar, to Bayezid. In the wake of these marriages, Stefan Lazarević became a loyal ally of Bayezid, going on to contribute significant forces to many of Bayezid's future military engagements, including the Battle of Nicopolis. Eventually, the Serbian Despotate would, on numerous occasions, attempt to defeat the Ottomans in conjunction with the Hungarians until its final defeat in 1459 and again in 1540. The Battle of Kosovo is particularly important to Serbian history, tradition, and national identity. The day of the battle, known in Serbian as Vidovdan (St. Vitus' day), is an important part of Serb ethnic and Serbian national identity, with notable events in Serbian history falling on that day, among which are: in 1876 Serbia declared war on the Ottoman Empire (Serbian–Ottoman War (1876–78)); in 1881 Austria-Hungary and the Principality of Serbia signed a secret alliance; in 1914 the assassination of Archduke Franz Ferdinand of Austria was carried out by Gavrilo Princip (although a coincidence that his visit fell on that day, Vidovdan added nationalist symbolism to the event); in 1921 Serbian king Alexander I proclaimed the Vidovdan Constitution; in 1989, on the 600th anniversary of the battle, Serbian political leader Slobodan Milošević delivered the Gazimestan speech on the site of the historic battle, etc. The Tomb of Sultan Murad, a site in Kosovo Polje where Murad I's internal organs were buried, has gained a religious significance for the local Muslims. A monument was built by Murad I's son Bayezid I at the tomb, becoming the first example of Ottoman architecture in the Kosovo territory. According to Sedlar: "Nearly the entire Christian fighting force (between 12,000 and 20,000 men) had been present at Kosovo, while the Ottomans (with 27,000 to 30,000 on the battlefield) retained numerous reserves in Anatolia." According to J. K. Cox: "The Ottoman army probably numbered between 30,000 and 40,000. They faced something like 15,000 to 25,000 Eastern Orthodox soldiers." According to Cowley: "On June 28, 1389, an Ottoman army of between thirty thousand and forty thousand under the command of Sultan Murad I defeated an army of Balkan allies numbering twenty-five thousand to thirty thousand under the command of Prince Lazar of Serbia at Kosovo Polje (Field of Blackbirds) in the central Balkans." ^ According to some Turkish sources, the "Christian army" led by Prince Lazar included contingents of Bulgarians, Albanians, Wallachians, Germans and Bohemians. Claims about such a coalition of Christian rulers first appeared about eighty years after the battle in a book written by an Ottoman author, Oruç of Edirne, and were repeated by later Turkish historians. Some of them added also Franks, Czechs, and Bulgarians to the aforementioned troops, claiming that there were 500,000 soldiers in the "Christian coalition". The reason for the Ottomans to represent the Battle of Kosovo in this way might lie in the fact that it was the only battle in which an Ottoman sultan was killed. The alleged participation of Đurađ II Balšić, the lord of Zeta, in Lazar's army is improbable: he had previously become an Ottoman vassal; he was in hostility with Lazar's ally Tvrtko I; and at the time of the battle he was most likely in Ulcinj. The participation of Teodor Muzaka and other Albanians is suggested by a family history of the Muzaka (Musachi) family, written in Naples in c. 1515 by John Musachi, who stated the following: "Lazar, the Despot of Serbia, and King Marko of Bulgaria (Bulgaria's monarch in 1389 was Tsar Ivan Shishman, who had been under the Ottoman overlordship since 1373. King Marko is referred to also as the king of Serbia in John Musachi's chronicle.) and Theodore Musachi, (Theodore Musachi is the younger brother of John Musachi's father, Gjin. According to the chronicle, Theodore died in the Battle of Kosovo, about 125 years before his nephew wrote the chronicle.) and the other Lords of Albania united and set off for battle, which the Christians lost." Robert Elsie, expert on Albanian studies, characterizes John Musachi's chronicle as "no work of great scholarship" whose historical accounts are confusing, although it is an important source for late 15th-century Albania. ↑ Daniel Waley; Peter Denley (2013). Later Medieval Europe: 1250-1520. Routledge. p. 255. ISBN 978-1-317-89018-8. The outcome of the battle itself was inconclusive. ↑ Ian Oliver (2005). War and Peace in the Balkans: The Diplomacy of Conflict in the Former Yugoslavia. I.B.Tauris. p. vii. ISBN 978-1-85043-889-2. Losses on both sides were appalling and the outcome inconclusive although the Serbs never fully recovered. ↑ John Binns (2002). An Introduction to the Christian Orthodox Churches. Cambridge University Press. p. 197. ISBN 978-0-521-66738-8. The battle is remembered as a heroic defeat, but historical evidence suggests an inconclusive draw. 1 2 John K. Cox (2002). The History of Serbia. Greenwood Publishing Group. p. 30. ISBN 978-0-313-31290-8. The Ottoman army probably numbered between 30,000 and 40,000. They faced something like 15,000 to 25,000 Eastern Orthodox soldiers. [...] Accounts from the period after the battle depict the engagement at Kosovo as anything from a draw to a Christian victory. ↑ Tanya Popovic (1988). Prince Marko: The Hero of South Slavic Epics. Syracuse University Press. p. 21. ISBN 978-0-8156-2444-8. ↑ Karpat, Kemal H.; Zens, Robert W. (2003). Ottoman Borderlands: Issues, Personalities, and Political Changes. Center of Turkish Studies, University of Wisconsin. p. 35. ISBN 978-0-299-20024-4. 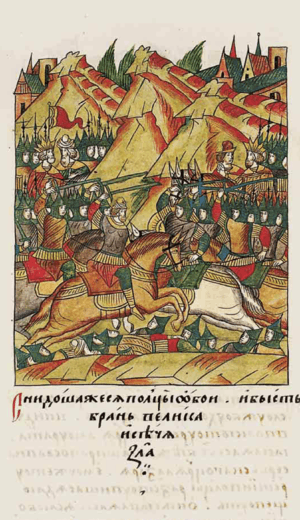 Troops of his emirate seconded Murad I in the battle of Kosovo Polje (1389), as indicated in the "Book of Victory" (Fatih-name) issued by Bayezid the Thunderbolt. ↑ Evliya Çelebi; Hazim Šabanović (1996). Putopisi: odlomci o jugoslovenskim zemljama. Sarajevo-Publishing. p. 280. Retrieved 26 July 2013. Paša Jigit- -beg, koji se prvi put pominje kao jedan između turskih komandanata u kosovskoj bici. ↑ Slavomir Nastasijevic (1987). Vitezi Kneza Lazara. Narodna Knjiga Beograd. pp. 187–. ISBN 8633100150. Serbian heavy cavalry took V wedge shape charge position breaking through Ottoman infantry and light cavalry. ↑ Wayne S. Vucinich, Thomas A. Emmert (1991). Kosovo: Legacy of a Medieval Battle. University of Minnesota. ↑ Imber, Colin. The Ottoman Empire: The Structure of Power, 2nd ed. New York: Palgrave Macmillan, 2009, p. 85. ISBN 0-230-57451-3. ↑ Vamik D. Volkan (1998). Bloodlines: From Ethnic Pride to Ethnic Terrorism. Westview Press. p. 61. ISBN 978-0-8133-9038-3. ↑ Donald Quataert (11 August 2005). The Ottoman Empire, 1700-1922. Cambridge University Press. p. 26. ISBN 978-0-521-83910-5. ↑ Isabelle Dierauer (16 May 2013). Disequilibrium, Polarization, and Crisis Model: An International Relations Theory Explaining Conflict. University Press of America. p. 88. ISBN 978-0-7618-6106-5. ↑ Sedlar, Jean W. East Central Europe in the Middle Ages, 1000-1500. University of Washington Press. p. 244. Nearly the entire Christian fighting force (between 12,000 and 20,000 men) had been present at Kosovo, while the Ottomans (with 27,000 to 30,000 on the battlefield) retained numerous reserves in Anatolia. ↑ Cowley, Robert; Geoffrey Parker. The Reader's Companion to Military History. Houghton Mifflin Books. p. 249. On June 28, 1389, an Ottoman army of between thirty thousand and forty thousand under the command of Sultan Murad I defeated an army of Balkan allies numbering twenty-five thousand to thirty thousand under the command of Prince Lazar of Serbia at Kosovo Polje (Blackbird's Field) in the central Balkans. 1 2 Antić, Čedomir (25 November 2010). "Bitka za bitku" (in Serbian). Politika Online. 1 2 Elsie, Robert (2003). "1515. John Musachi: Brief Chronicle on the Descendants of our Musachi Dynasty". Documents 16th to 18th centuries. Texts and Documents of Albanian History. Archived September 10, 2010, at the Wayback Machine. Vojna Akademija (1972). "Kosovska bitka". Vojna Enciklopedija (in Serbo-Croatian). Belgrade: Vojnoizdavački zavod JNA. John V. A. Fine; John Van Antwerp Fine (1994). The Late Medieval Balkans: A Critical Survey from the Late Twelfth Century to the Ottoman Conquest. University of Michigan Press. ISBN 0-472-08260-4. Gliša Elezović; Neșrı̂ (1940). Boj na Kosovu 1389 g. u istoriji Mula Mehmeda Nešrije. Štamp. "Luč". Branislav Đerić (1989). Kosovska bitka: vojno-istorijska rasprava. Naučna knjiga. Ćirković, Sima M. (1990). Kosovska bitka u istoriografiji. Zmaj. Petar Tomac (1968). Kosovska bitka. Vojnoizdavački zavod. Jov Mišković (1933). Kosovska bitka 15. juna 1389. godine. Planeta. Nikola Kusovac (1988). Kosovska bitka: mit, legenda i stvarnost. Litera. Rade Mihaljčić (1989). The Battle of Kosovo in history and in popular tradition. Beogradski izdavačko-grafički zavod. Emmert, Thomas Allan (1990). Serbian Golgotha: Kosovo, 1389. East European Monographs. ISBN 978-0-88033-175-3. Wikimedia Commons has media related to Battle of Kosovo. Charles Simic, ed. (1987). "Serbian Epic Poems - The Battle of Kosovo". Rastko.